Sorry, no nail photos today but I'll have some tomorrow! I'm just letting you know that after a lot of playing around I managed to put a 'like' button for facebook at the end of each post. However, it's a bit special and you have to push 'confirm' then 'like' before it'll work. Try it out and you'll know what I mean. I'll try fix this at some point but I thought I'd just highlight it :). 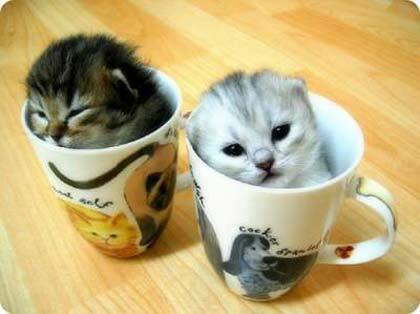 And to make this post a whole lot cuter, here's a picture of some cute kittens in a mug I found on this site.